opting maybe a fringe/bangs, that kind of thing. a photo essay of the kind of look you would like to have. You can even compile pics of the kind of look you don’t want. and try to judge if your hair is similar or able to sit like your subjects hair. to keep it looking as you want. skin tone and/or hair texture. 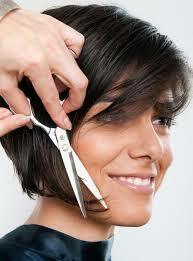 may be for your own skills, so at home you can recreate what was achieved in salon. A change is often a good thing, a successful change is simply wonderful!